Monica S. Borine Ph. D (Brazil) Clinical Psychologist, Pedagogue, doctorate in Health Psychology in Assessment in Mental health and Psychopathologies, Master in Neuropsychology of Consciousness, Emotion and Cognition by São Paulo University and San Francisco Univesity. Specialist in Orgonomist (concepts and Therapy W. Reich), Bioenergetics analyst and psychotherapist in Core Energetics by Core Energetics Institute of New York. Yogaterapy and Tibetan Psychology in Rishikesh, India. Clinical Hypnosis for University of São Paulo since 1987. Post graduation in Psychology of Consciousness, Transpersonal Psychology. Consciousness researcher, anomalous phenomena and UFOs and abductions contact for over 25 year. Founded thePsychoenergetics of Consciousness in April 2002 at I Symposium of Consciousness in Bahia – Brazil. Founded the Exopsychology in 2014 16 May at the III Latin American Congress of Psychology in Guatemala. Institute Exopsicologia Brazil in Atibaia – São Paulo (www.exopsicologia.com.br). Institute of Integral Consciousness Education Extension (www.inic.com.br). Core Energetics Institute of Brazil (www.brasil-coreenergetics.com.br). 2010 I International Wilhelm Reich Congress and II Core Energetics Psychotherapy Congress. Member of the ASP (Association Science Psychological), California, USA. 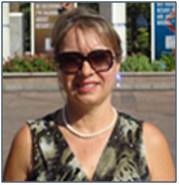 Monica Borine is a member of the Advisory Board of the Exopolitics Institute.